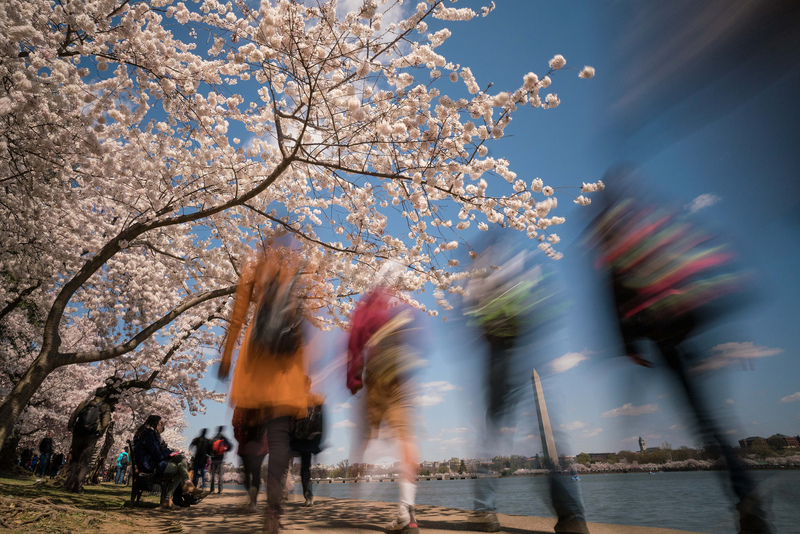 This image is not your typical cherry blossom season photograph but what a great long exposure shot taken by Kevin Wolf at the Tidal Basin! He maximizes the long exposure by combining the stillness of the cherry blossom trees with the movement of passersby. When taking shots like this, it is best to use a tripod for maximum stability as well as a timer or wireless remote so that you do not shake the camera. The main setting you will have to play with is the shutter speed, which is the length of time your camera shutter is open, and this will vary depending on how fast your subject is moving. A slower shutter speed may mean lowering your ISO and using a smaller aperture to get the proper exposure.